In August, estranged AC/DC members Brian Johnson and Phil Rudd were photographed together outside Vancouver’s Warehouse Studios – the location where the band recorded their last three albums. It sparked hopes that the vocalist and drummer were back with the band after they had been replaced by Axl Rose and Chris Slade for the Rock Or Bust world tour. The pair were later spotted with longtime AC/DC engineer and mixer Mike Fraser, while guitarists Angus and Stevie Young were also seen in Vancouver. There’s been no word since, but could some big AC/DC news be coming in 2019? We certainly hope so! We’re so used to our favourite artists recording and touring that when they announce their decision to bring the curtain down, it always comes as a bit of a shock. And in 2018, we saw Slayer and Ozzy Osbourne hit the road for the last time. In January, Slayer announced their final tour, with Tom Araya, Kerry King, Paul Bostaph and Gary Holt playing shows across North America, the UK and Europe this year. The tour will continue in 2019, when they’ll be joined by Lamb Of God, Amon Amarth and Cannibal Corpse. Ozzy Osbourne, meanwhile, announced he would head out on the road on his No More Tours 2 run of shows in late 2017. But he was forced to postpone the remaining dates on the North American leg back in October due to undergoing surgery on his hand. He’ll make up the dates in 2019, where he'll be joined by Megadeth, while the Prince Of Darkness will return to the UK and Ireland at the end of next month. However, despite not touring again, Ozzy won't be retiring. “I’ve experienced fantastic things – it’s been an incredible journey. I just need to slow it down a little," he said. In September, Kiss announced their intentions to rock the world one last time. Paul Stanley, Gene Simmons, Tommy Thayer and Eric Singer revealed a run of shows that will take place between January and July in the US, Canada, Russia, Europe and the UK, with the band adding further North American dates back in November. Announcing the End Of The Road tour, the band said: “All that we have built and all that we have conquered over the past four decades could never have happened without the millions of people worldwide who've filled clubs, arenas and stadiums over those years. “This will be the ultimate celebration for those who've seen us and a last chance for those who haven't. Former Kiss guitarist Vinnie Vincent made his return to the stage for the first time in 30 years in November. Vincent appeared at a Kiss Kruise pre-launch party, complete with his Ankh Warrior make-up, to rip through Kiss classics Lick It Up, I Love It Loud and Cold Gin. Earlier in the year, Vincent gave his first public interview in 20 years at a Kiss Expo in Atlanta, where he revealed he was in talks with publishers about an autobiography. In early January, we received news that former Motorhead guitarist “Fast” Eddie Clarke had died at the age of 67 after a battle with pneumonia. 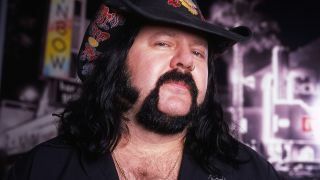 Clarke’s death meant that all three members of Motorhead's classic lineup were now gone, following the deaths of Lemmy and Phil “Philthy Animal” Taylor. Clarke played on Motorhead’s self-titled 1977 debut album and also on 1979's Overkill and Bomber, 1980’s Ace Of Spades and 1982’s Iron Fist. Following the news, tributes began pouring in via social media, with Phil Campbell, Saxon, Duff McKagan and Scott Ian among those to post messages. In February, it emerged that Judas Priest guitarist Glenn Tipton had been battling Parkinson’s disease. He had been diagnosed with the early stages of the disease 10 years ago and played on every track on Priest’s latest album Firepower. But for the band’s tour in support of the record, Tipton was forced to take a step back, with producer and guitarist Andy Sneap stepping in for the live shows – although Tipton continued to play from time to time. Tipton later issued a statement addressing his ongoing battle with Parkinson’s, saying: “I knew something was wrong with my co-ordination and fluency regarding my playing, but I worked around it and battled on. Priest then set up the Glenn Tipton Foundation and recently announced they’d head out on tour in 2019 with special guests Uriah Heep. In September, Motley Crue frontman Vince Neil caused a stir when he tweeted that he, Tommy Lee, Nikki Sixx and Mick Mars were back in the studio. It had been thought that Crue were done after they brought the curtain down on their 34-year career in 2015. But, following Neil’s tweet, bassist Sixx reported that the four new tracks were for the long-awaited biopic on the band The Dirt. He later added: “I’m listening to the roughs of the new Motley Crue and it feels real and raw. Everybody is playing like mad and the songs crush. We can't wait to hear what they've been up to. Queen’s highly-anticipated biopic Bohemian Rhapsody was finally released in October after years in development hell. The film was first announced in 2010, with Mr Robot star Rami Malek brought onboard to play Freddie Mercury in November 2016 following the acrimonious departure of Sacha Baron Cohen. Director Bryan Singer was then fired in December last year, with many wondering if the project would ever see the light of day. Well, it did – and it’s enjoyed massive success even though it’s only been out for a couple of months. Malek is joined in the cast by Gwilym Lee as Brian May, Ben Hardy as Roger Taylor, Joe Mazzello as John Deacon, and Lucy Boynton as Mercury's lifelong companion Mary Austin. Not only has it become the biggest-selling music biopic of all time, it also received a pair of Golden Globe nominations – with the winners set to be announced at the Beverly Hilton, Beverly Hills, on January 6. Still haven't seen it? Whet your appetite with the final trailer for the film below. Divisions within Fleetwood Mac came to a head in January this year, when the band sacked Lindsey Buckingham. He was dismissed due to a scheduling conflict centred around a world tour – and he was subsequently replaced in the touring lineup by Heartbreakers guitarist Mike Campbell and Crowded House leader Neil Finn. Buckingham then filed a lawsuit against his old bandmates, claiming that he lost up to $14 million as a result of his sacking. However, in early December, it emerged that the lawsuit had been settled. But, despite the end of the legal wrangles, it appears there’s still some acrimony in the air as Buckingham called Fleetwood Mac a “cover band” just before Christmas – but also said he would return to the lineup if asked. Fleetwood Mac have a run of live dates planned in 2019, including a handful of European shows. Ever since Axl Rose, Slash and Duff McKagan got back together in 2016 for the Not In This Lifetime tour, fans have been wondering if they could return to the studio to make new music together. Rush have been on hiatus since wrapping up their North American R40 tour in 2015, but fans had still held out hope that the Canadian trio could return at some point in the future. Vocalist and bassist Geddy Lee then checked in to say that there was “no chance” of seeing them tour again and recently reported that drummer Neil Peart hadn’t just retired from the band, but had stopped playing altogether. The end of an era for sure, but Rush have left us with a wonderful body of work. One of the most bizarre stories from 2018 is that of Jered Threatin, aka, Jered Eames. He became the talk of the rock and metal world in November when his European tour turned into a chaotic mess when he played to empty halls, with it later emerging that he had faked a publicist to entice venues to book him and his band, while the dubious websites associated with the vocalist and guitarist were all registered at the same domain registrar around the same time. But the strange story didn’t end there, with Eames then saying that in an effort to generate publicity for the tour, he attempted to tip off the media to his scheme by sending an anonymous email ahead of the live dates. You would think such a stunt would have ruined his young career, but Eames claimed to have sold thousands of CDs since the debacle and that he’d been in meetings with film producers who want to turn his adventures into a movie.